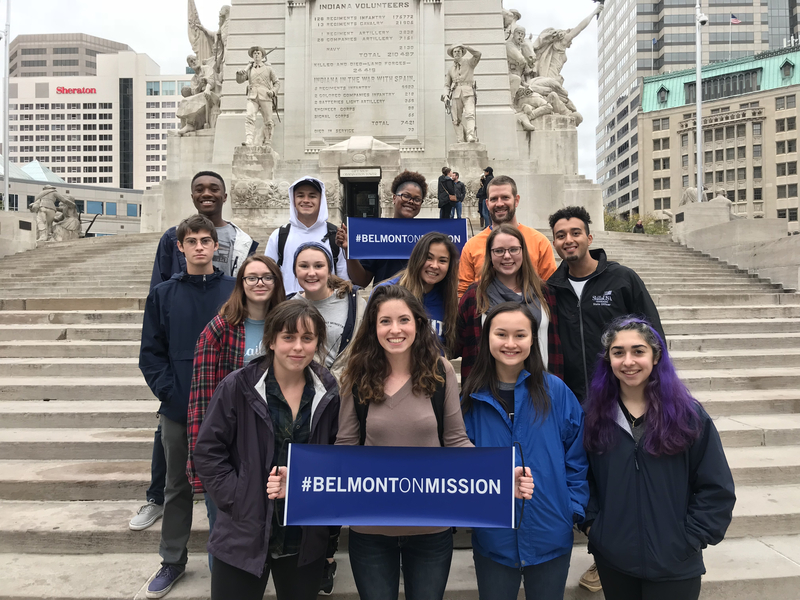 Instead of taking a vacation or visiting their family over fall break, more than 85 Belmont students, faculty and staff spent their time away from campus this semester taking the ‘plunge’ — a tradition that has been hosted by Belmont’s Office of University Ministries for the past six years. This year’s teams traveled to St. Louis, Memphis, Birmingham, Indianapolis and Atlanta as they worked with local organizations that serve the people of each city. In St. Louis, a team worked alongside New City Fellowship and City Lights serving widows by building a wheelchair ramp, mowing lawns and completing roof repair and basic construction projects. While there, the group also participated in a civil rights tour of the city which included many historical sites. Each of the teams did similar work in different cities, working in food pantries, with children’s ministries, urban gardens, ministry with those experiencing homelessness, and in local schools. Teams also worshipped on Sunday morning in a variety of urban church settings. For more information about Plunge and other service opportunities through University Ministries, click here.